Thanksgiving, a festival of peace, a festival that marks the change of season. Its the festival of seed time, harvest and thanking god for everything. Thanksgiving has huge importance as it preaches the connection of god with everything that happens around. Its important for our kids to know about the rich history and religious importance of this festival. Inculcate the history with a pinch of fun. Make this festival fun and enjoyable for kids by dressing them in various thanksgiving Costume like pilgrim costume, turkey Costume and make them learn the importance in a fun way. 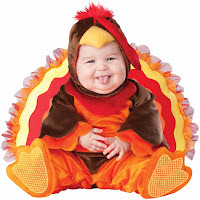 Whenever people think of Thanksgiving,the first thing which strikes their mind is Turkey.Dress up your kids as America's favorite Thanksgiving bird. Don't let your kid miss the fun.This hysterical and super cute costume will surely be a hit. Imagine your kid walking in this Princess Wildflower Child Costume at ThanksGiving party. This costume is very impressive.Your daughter will really look pretty and it is even more comfortable to wear. Accessories the costume with shoulder sling for bow and arrow and get all type of compliments for your daughter. Pay tribute to the Pilgrims with this Pilgrim Boy Costume. This costume captures the essence of a true traditional pilgrim boy. Just get an additional toy gun for that complete look. This costume is suitable for plays,Thanksgiving parades and historical reenactment. Be wealthiest among three wise men. This costume includes multicolored robe with solid colored inlet, and matching crown. So grab all attention towards your kid and celebrate thanksgiving without putting much burden to your pocket. Get Running Bull Child Costume and remember great Native Americans. 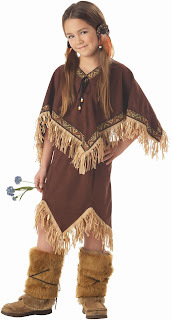 Chase away all the trouble and be ready to lead friends of your tribe.This costume has an authentic presentation and includes brown pants and top with fringe, Indian design trim, and matching headband with feather.Don't forget to get bow and arrow. So pull up your sleeves and get dressed to thanks the Lord and have a Gala time with the Family.